Now you can carry your whole computer system with you on just a simple USB hard drive. I too was very much amazed when i came to know of this. Mojopac just lets you do this and makes your whole system fit into just a small pendrive, including all your favorite software, files and applications and makes you feel as if you are on your own PC. 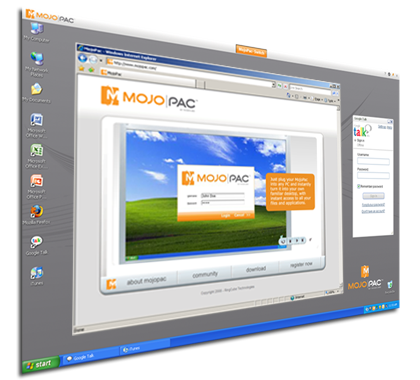 Mojopac is simple and easy to use, just download it and install on the portable pen-drive. Then make an account and install all your favorite applications on it. You can install office 2007 on it, or carry the favorite game on mojopac, or carry you Instant messenger such as Gtalk or Yahoo Messenger or any windows application you want. When you want to run it just put the pendrive in and run mojopac. Enter the username and password and you will have your installed mojopac applications in front of you. Mojopac doesn’t cause any change to the system that is being used in or any change on your mojopac will not be shown on the PC. Mojopac rus on any PC with XP and minimun 256MB RAM and gets installed on any USB with just 32MB but need additional space for other software to get install. I loved the software as it is simple, easy, very useful and free to use.